The Brandenburger Tor in Berlin, Germany is both a symbol for the division of Germany after the Second World War and a symbol for the reunion of the two partial states of Germany. In the northern gate building a room for silence was established in the year of 1994. The model for this space was the meditation room which the Swedish UN-General Secretary Dag Hammarskjöld set up for himself and his staff in the UN-Building in New York. 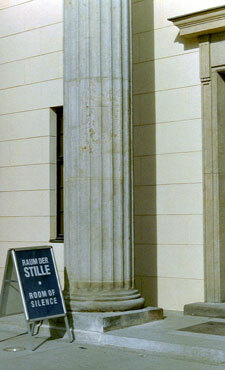 The space is run by the association 'Raum der Stille im Brandenburger Tor e.V. '.